My father is a physicist, so discussions about complicated topics would often start with the admonishment “Define your terms!” so that reasoned arguments would not be lost or garbled because the debaters did not share a common definition of material elements. And so it should be with business terms, even those that have been so over-used by the media, bloggers, and innumerable consultants that they have lost their meaning. ‘Brand’ and ‘presence’ run that risk as they have become very popular buzz words in the past few years. It is worth defining them, so that we can understand the differences between them and how they interact. Then we can work on making them your powerful allies and good friends. The term ‘personal brand’ co-opts the notion of a commercial brand so that traditional commercial attributes are applied to an individual, particularly to someone’s name. A commercial brand can be associated with Quality, Durability, Economy, or even Humor. As you build your personal brand, you ask yourself: what do I want people to think of when they think of me? That I am tech-savvy ? Wise? Quick to respond? Depending on your business, certain associations are very beneficial. If you are investing your clients’ money, they should trust you. If you are a designer, they should appreciate your good taste. If you are a shuttle driver, they should anticipate your punctuality. The components of your marketing materials and your self-packaging are effective when they reinforce those associations. A private nurse would choose a logo that makes clients think of competence, kindness, and confidentiality. A slogan for a carpet-cleaning business might be related to fresh beginnings and restoration. Everything the customers see and hear about your business should build on and emphasize that positive reminder, from your ads, your brochures, and your vehicles to your appearance, reputation, and testimonials. It does not need to be complex–sometimes a single word can define your brand–but the message should be consistent. Most business owners have spent considerable time defining their brand, but they are less comfortable with their ‘presence.’ Do you have a strong presence? Not sure? You are not alone. A recent study published by the Center for Talent Innovation (CTI) reported that women find feedback about professional presence so contradictory and confusing that 81% said they didn’t know how to act on it. I’m here to say: it doesn’t have to be that hard. Let’s break it down. ‘Presence’ is something that many people believe they can sense but they can’t describe. Others define it in so many different ways, it seems to cover everything from your toenails to your brain. That can be pretty hard to put into action. But after many years in business and working with clients in my Creating Executive Presence program, I believe we can identify behaviors and styles that support a strong ‘presence’ and that we can teach and develop those. Your presence is how you make others feel, and good things happen when people feel good around you. Much of the garbled advice stems from confusion between cause and effect. We know that someone with a strong presence makes us feel a certain way–that the person is trustworthy for example–so we ascribe that characteristic to the person and claim that he or she is trustworthy. That is a fallacy. People with professional presence are not necessarily trustworthy, but they make those in their presence feel as though, or suspect, or hope that they are. Professional presence could be called the ability to master perceptions. A professional presence is important for you as a business woman because it is how you embody your brand and convey its message through your individual interactions with your clients. No matter how good your marketing campaign is, it will fail if you personally come off as conniving or indifferent or any other negative impression that undermines your brand. People are remarkably observant and are quick to leap to conclusions about what kind of person you are based on a few minutes in your presence. When I coach clients about their professional presence, I focus on teachable behaviors that demonstrate an inner desirable quality. For example, to communicate credibility, the associated behaviors would be: Say what you mean, and mean what you say. Be sure of your facts. State your position clearly, If you’re an authority, speak with authority. Admit what you don’t know. Because you don’t have time to prove your credibility over a long period of time, you must use behaviors that are associated with credibility and encourage others to give you the benefit of the doubt in the meantime. Developing your professional presence includes learning how not to behave, so you don’t send the wrong message. Some professionals are kind and empathetic people, but their insecurity and lack of training result in an impression of arrogance or insensitivity. They slump and look shifty; they mutter and study their shoes; or they stare over the heads of their audience and use esoteric terms that no one can connect with. These are people who could benefit from professional presence training because their behavior is encouraging their audience to draw the wrong conclusion about them. Personal appearance is a factor in your professional presence, but it is frequently over-emphasized. Even the magazine Marie Claire, after publishing the results of the study mentioned above, couldn’t resist running a side article advising women to wear makeup, but “no chipped nails!” I think advice for working women focuses too frequently on appearance, while avoiding more substantive issues, to their detriment. If someone truly has a strong presence, you might not notice what she is wearing because you are paying more attention to what she is saying. A strong presence is more often attributed to a man, so women will have to work extra hard to communicate their brand message. 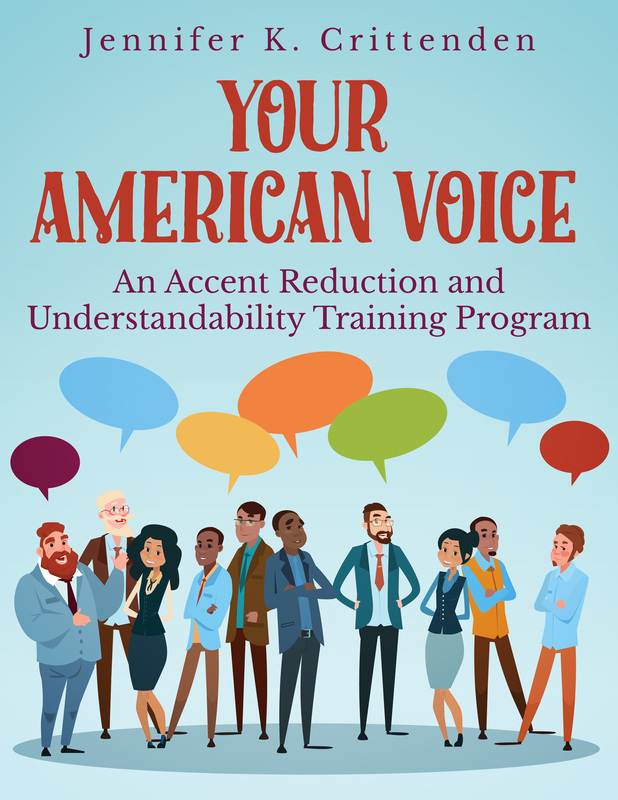 Since we are not usually six feet tall, deep-voiced, with a touch of gray, our presence is going to look different from the typical white, male business man. On the other hand, women with presence can be very different from one another. They each have developed a style that is appropriate for their individual personality and business. That means that you too can develop a presence that is female, powerful, and unique. I encourage you to study videos of women that you admire and analyze their subtle behaviors that make a positive impression on you. You can also record yourself on videotape to practice speaking and moving in ways that send the right message to your audience, one that is consistent with your brand. You can also be alert for mannerisms that detract from your presence. I recommend focusing on behaviors that can be analyzed, evaluated and practiced. It’s harder than painting your nails, but the results are more profound and longer-lasting. 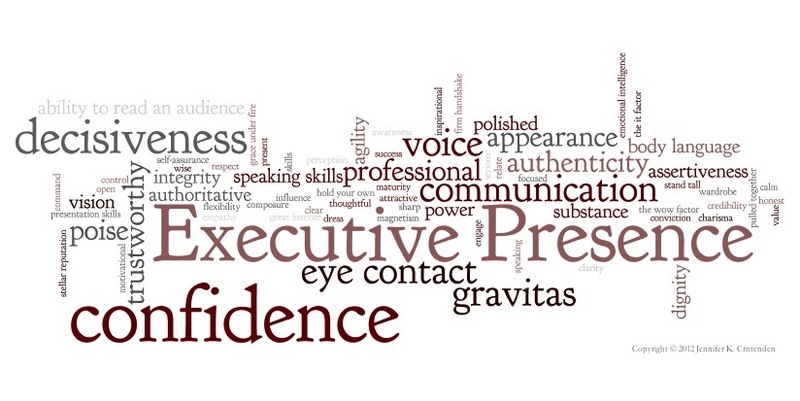 Developing a strong professional presence will add great value to your brand. Excerpted from The Business Woman’s Personal Branding Guide, a NAWMBA eBook, 2013. The program includes self-assessments of areas related to authority, credibility, authenticity, trust, composure, and confidence. Tactical lessons include voice, body language, social and language skills. Context-specific behaviors are identified, studied, evaluated, and practiced. Individual coaching is provided in ten 90-minute video-Skype sessions, followed by readings and exercises, including audio and video analysis of self and others. 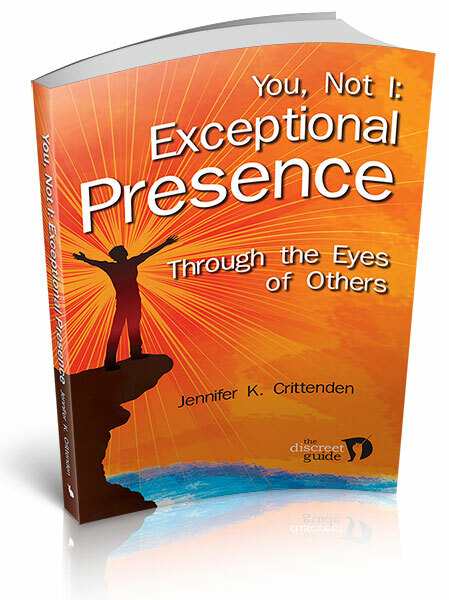 Participants will receive Crittenden’s new handbook Creating Exceptional Presence (Whistling Rabbit Press, 2014), addressing such topics as behaviors versus perceptions, derailers, stage fright, and pre-performance rituals. Program time totals 56 hours, typically over six months. More information here.